If you're after a proper no-nonsense 4x4 there are now surprisingly few choices available. Most modern big four-wheel drives - or SUVs as they're now known - are not about off-roading at all. So if you want something that is rough, tough and can deliver when it comes to towing plus stands up to plenty of abuse, what do you go for? Well the Mitsubishi Shogun has always fitted that bill perfectly. Refined it may not be, especially compared to something like a modern Land Rover Discovery, but it's well built, robust and most of all, reliable. Maybe we're being a bit harsh when we say the Shogun isn't especially refined - it does everything you ask of it and with seven seats makes a good family car too. So what are you looking at for £5000? Well we came across this very nice 2003-registered 3.2 DI-D Field model - in National Trust green of course - with just 65,000 miles on the clock. Way below average for a 12-year-old car. Even better, it has a full dealer service history and only two previous owners. All good so far. The Shogun always represented a lot of 4x4 for the money when new and that's still the case as a used buy. 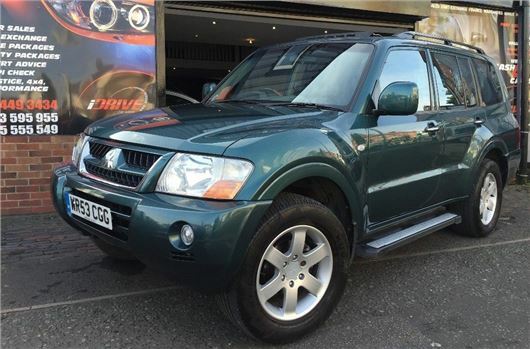 You'll be hard pressed to find any basic models, as Mitsubishi had the nouse to give the majority of models a high standard specification. The Field was a special edtion for 2005 and would have cost £28,499 when new. It comes with leather seats, climate control and a lovely wood effect trim on the dash. The latter is particularly delightful. It's powered by the 3.2 DI-D diesel with 160PS and a hefty 350Nm of torque. There was a manual but fortunately this is the much more preferable automatic. The DI-D was a fairly agriculatural engine when new and compared to modern diesels, the four-cylinder unit is very noisy and clattery. There's no denying the DI-D has plenty of pulling power though and it gives the Shogun a decent turn of pace from low down. In fact the Shogun is surprisingly nippy if you want it to be. And it settles down on the motorway to happily - if noisily - cruise along. In terms of running costs, the Shogun is pretty reasonable given it's a hefty 4x4. CO2 emissions are high meaning annual road tax of £290. It could be worse - this Shogun is one of those odd cars with emissions that by right should mean it costs £495 a year, but fortunately it was registered before 23 March 2006 so is exempt and sits in Band K rather than M.
The official average economy figure is 26.9mpg and Real MPG shows that you'll be looking at real world figures close to that. Expect to see around 25mpg. Obviously if you're towing a caravan or horsebox you won't be seeing those figures, but this Shogun does have a proper tow bar with electrics already fitted. The Shogun is fairly bullet proof but there are a couple of things to look out for. The automatic gearbox and transfer box need a change of fluid every six years or so. It's also vital that the nylon cam chain top guide is checked and replaced as necessary. It usually lasts around 70,000 to 90,000 miles. It only costs £10, but its failure can lead to the chain coming off and wrecking the engine. Overall this Shogun looks pretty tidy. There are a few grazes on the bumpers, the sort of thing you'd expect on a big 4x4 that's more than 10 years old, but nothing serious. The interior is in good condition with little wear to the black leather seats. Although it's very quaint to see a cassette player still fitted. You may have to explain what one of those is to the kids. As proper rough and tough 4x4s go, the Shogun still has plenty of appeal. Yes you could look at a Land Rover Discovery but at this money you'd only find older cars or examples with much higher miles. The Shogun has proved more reliable over its lifetime, so while it may not have the badge, it still has all the qualities you want in a 4x4.